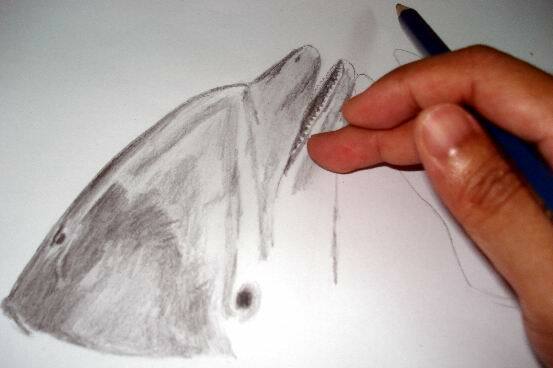 If you already have all that is required, than you can start your dolphin drawings in pencil. 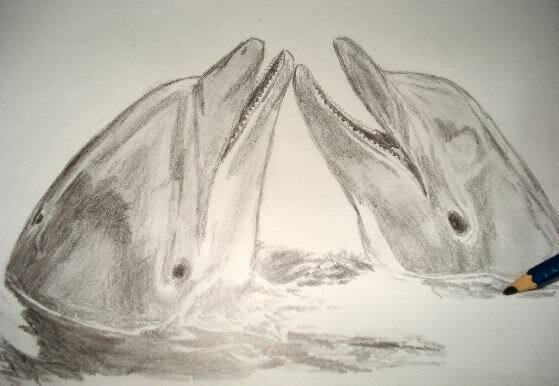 Okay, here are some examples of dolphin drawings in pencil that I've drawn in a step-by-step images. 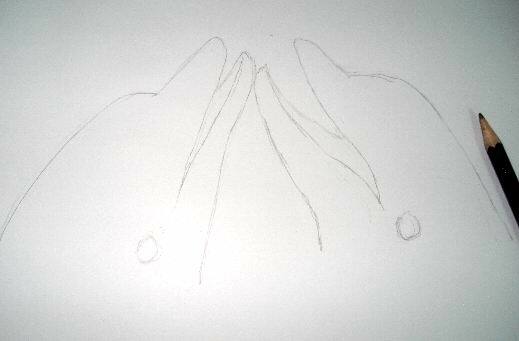 Dolphin Drawing - Step 1. Usually the technique of drawing involves the use of finer lines. So, the ideal choice of paper is a smooth surface paper. 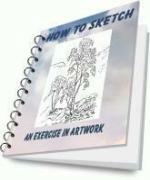 You can start by doing a sketch drawing in outline form, using a sharpened HB grade graphite pencil. 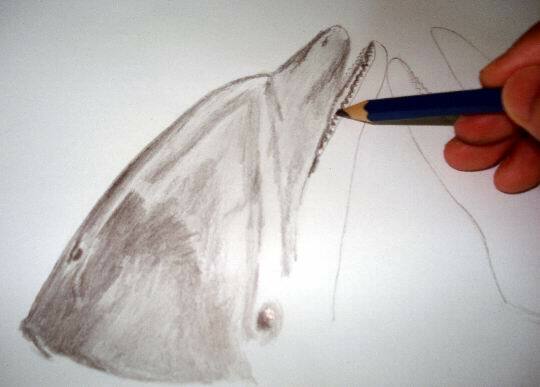 Dolphin Drawing - Step 2. 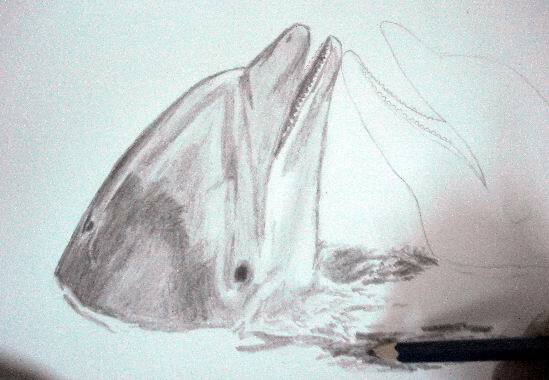 With a 2B grade sharpened pencil or a mechanical pencil, re-sketch your dolphin sketches to get a clear fine line. 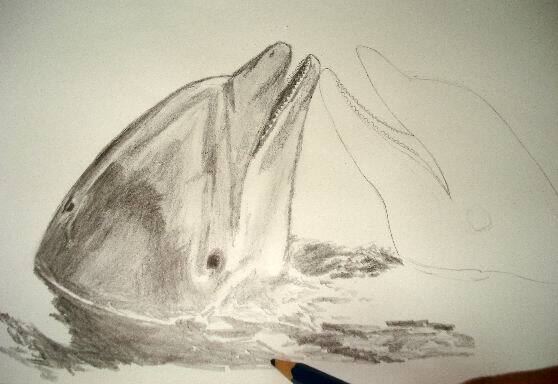 Dolphin Drawing - Step 3. 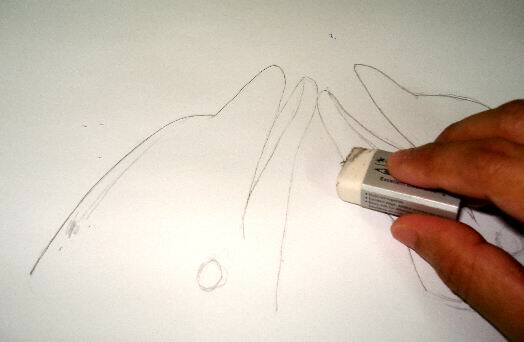 With an eraser, erase gently your dolphin sketches to remove unnecessary lines leaving fine sketch of the 2B pencil. 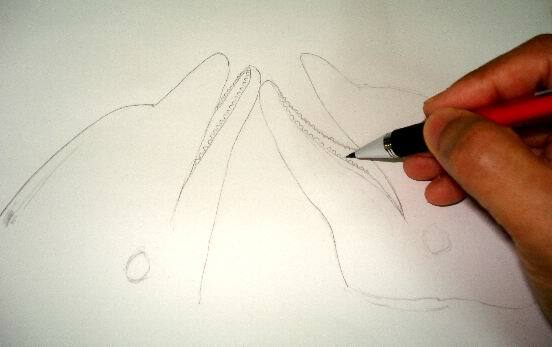 Dolphin Drawing - Step 4. 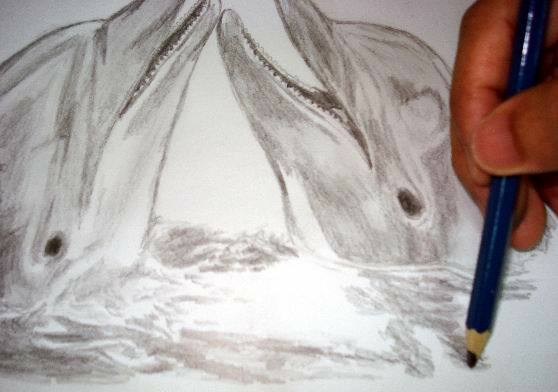 Use either a sharpened 2B pencil or a mechanical pencil to re-draw the lines of both dolphins. Take extra attention to draw small semi-circles on their jaws to represent the teeth. Okay...put down your 2B pencil and take a 4B grade graphite pencil. Start to create tones on the back of the dolphin. If you're right-handed, start from your left and vice-versa if you're left-handed. Ah-Hah...This is a tricky part. Use your finger to smudge tones. If you're unsure, I suggest you try it on other piece of scrap paper. After you're confident than do it on your art work. Otherwise, you might spoil your dolphin drawing. Use your smallest finger if necessary. 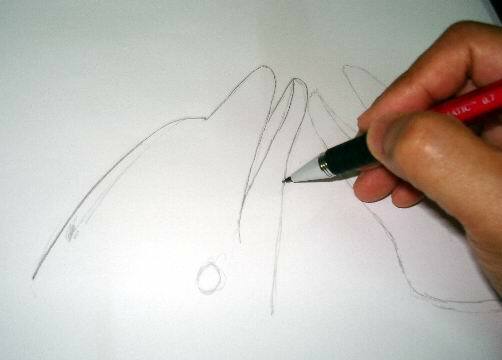 Start to pour water on your dolphin drawing. Excuse me...please don't pour real water. 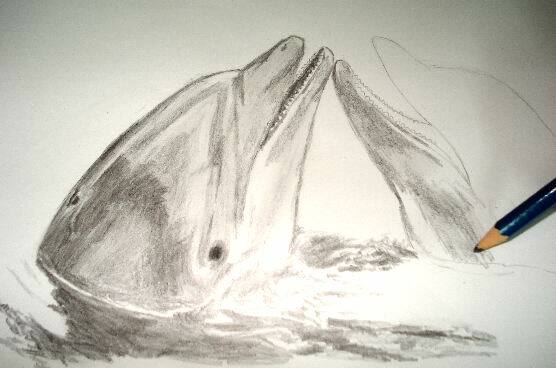 Apply darker strokes for dolphin body parts in water and light tones elsewhere. Continue to add darker tones to show dolphin's body under the water. Continue to toning the other dolphin. For the darkest tones, use a 4B grade graphite pencil. 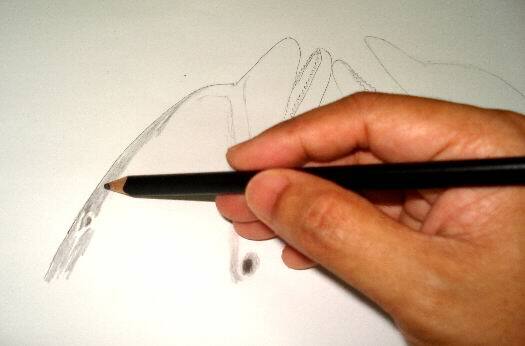 If possible use a 6B grade graphite pencil to create darker tones inside the mouth parts. Start to create water images. Use darker tones to show its body under the water. Keep it in a folder or paste it on your room's wall. I highly recommend that you scan your artwork or at least take a few snaps using a digital camera and then store your images at any available free image hosting company like Photobucket. Learn again? Click here - to learn again. Get it? 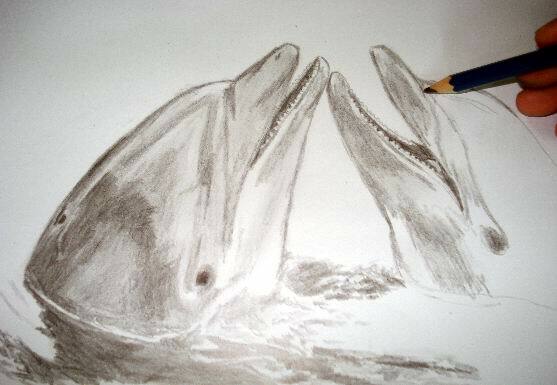 Or have any questions or comments on how to draw realistic dolphin drawings in pencil? 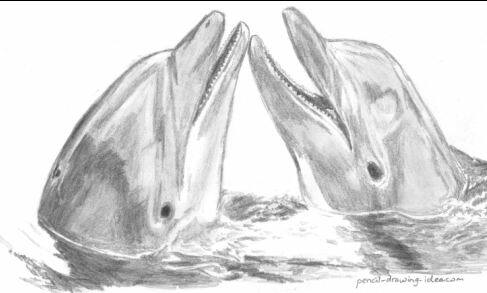 Click here to ask or comment on dolphin drawings.